This Starter Kit contains one pair of electrode pads, a storage pouch with cloth handle, and appropriate safety instructions and labels. 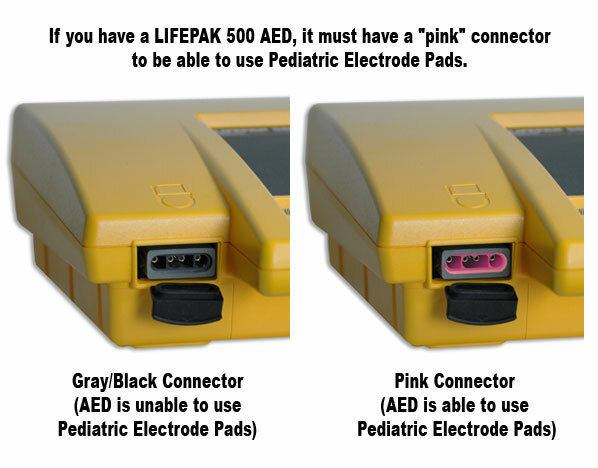 Infant/Child Reduced Energy Defibrillation Electrode Pad - use only with LIFEPAK® 500 AEDs with a pink connector (standard on AEDs built after 8/9/02 More Info) or any LIFEPAK CR® Plus or LIFEPAK® 1000 defibrillator. Intended for use on children up to 8 years of age or 25kg (55lb). The Infant/Child Reduced Energy Electrode Pad is smaller than adult defibrillation electrode pads. The electrode pad reduces the energy dose that is delivered to the patient by a factor of four. If the AED is set up to deliver a dosage of 200, 300, 360J using adult defibrillation electrode pads, the dose will be approximately 50, 75, 86J with the Infant/Child Reduced Energy Electrode Pads. To extend a community heart-safe program to children eight and under, order the Infant/Child Reduced Energy Defibrillation Electrode Pads. While few patients will ever be candidates for this therapy, the Infant/Child Reduced Energy Electrode Pad offers the opportunity to save many years of someone's life. Biphasic LIFEPAK® 500 AEDs that do not have pink connector plugs (inner lining on the AED's electrode receptacle) can be upgraded to accept the low-energy electrodes.